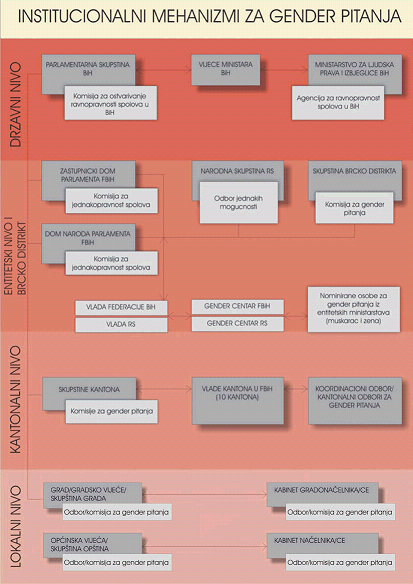 The Law of Gender Equality in Bosnia and Herzegovina has established the Agency for Gender Equality of Bosnia and Herzegovina and the gender centres (Gender Centre of the Federation of Bosnia and Herzegovina and Gender Centre- Gender Equality Centre of the Government of Republika Srpska) which exist on the entity level. 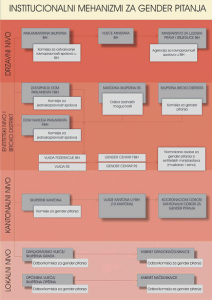 The Agency and the entity gender centres are public institutions i.e. governmental bodies. All institutional mechanisms have precisely defined mandate, which shows governments’ commitment to achieve gender equality and inclusion of gender issue in all segments of social life. Yet, the Agency and the entity Gender Centres represent the real drivers of the initiatives and measures, and the key implementers and monitors of the gender mainstreaming in BiH. These three institutional mechanisms for gender equality are crucial instrument in initiating and implementing activities in the area of gender equality. They have the prominent place considering their activities, projects and measures which they have undertaken to strengthen and ensure sustainability of institutional mechanisms for gender equality, as well as to initiate establishment of such mechanisms at the local level.